This is what we do, this is how we live. Come skiing with us. in the places we like to ride, to get out of every day in the mountain a great adventure! I was born in flatlands in 1978. The first part of my life had nothing to share with mountains. Only later, I realized clearly what I was really searching: the everyday adventure in the mountains. I lived my last 15 years between the Dolomites, Sweden, Chamonix and Courmayeur. In 2008 I got into steep skiing and it was love at first sight. Later on I became certified UIAGM Mountain Guide. Following the tracks of a famous italian skier, Stefano de Benedetti, I left the tracks of my skis on North and East Face of Aig Blanche, North Couloir of Col Armand Charlet, North Face of Pain de Sucre and Couloir Whymper at Aig. Verte. My desire of new experiences leads me in mountains with clients, giving me the possibility to share with passionate people incredible moments of pain, joy and happiness. I started skiing at the age of 6, and only at 18 with snowboard. In 2000 I became snowboard instructor, becaming one of the first certificated snowboard instructor of Valle d’Aosta. I always loved snowboarding on untouched slopes, both in the forest or in high mountains. 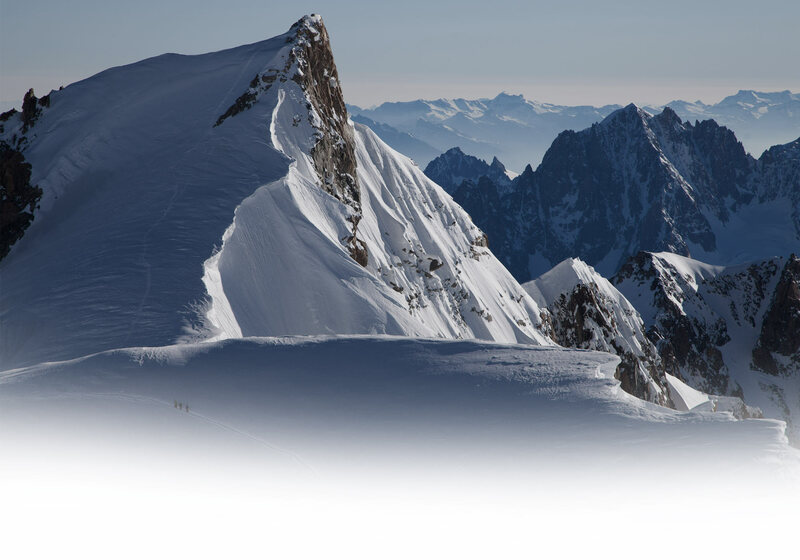 In 2002 I started with the beloved game of steep snowboarding in the mountains: over the years I spent more and more time on the Mont Blanc massif, till the point I decided to transform it my home. 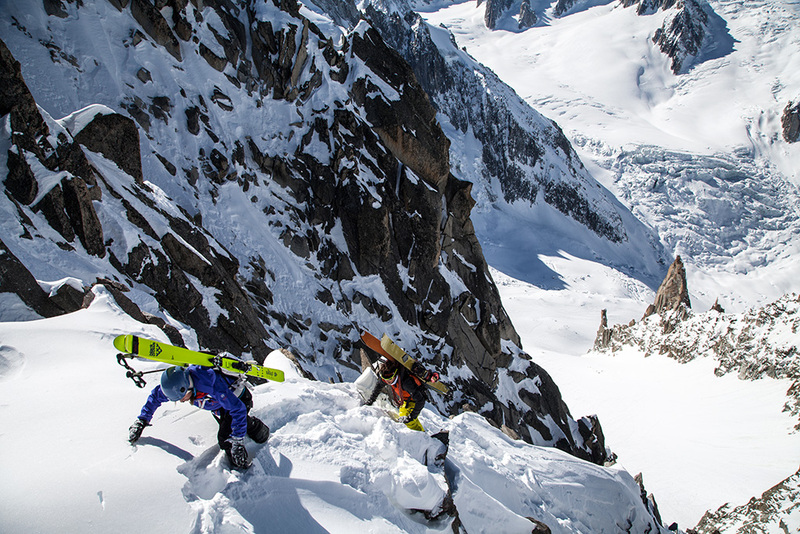 I invested my last 10 winters on my passions – freeride and steep skiing -, succesfully skiing many committing lines like: East Face of Aiguille Blanche de Peuterey, Couloir Nord of Col Armand Charlet, North Face of Pain de Sucre and West Face of Mont Blanc. In the last years, thanks to evolution of splitboards, I spend most of the winter searching for new ridable lines and finding quiet spot away from the crowds of snow stations. 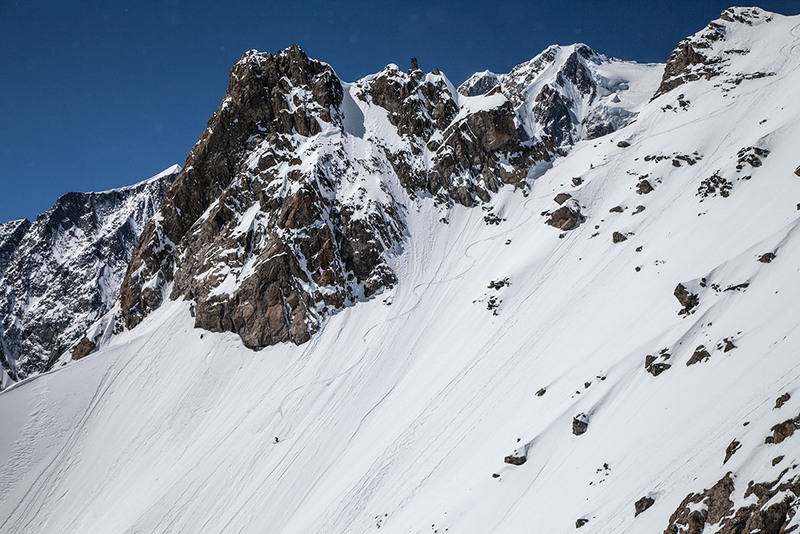 Find your dream line and ride it with us. This is the program for all of you looking for the soft creamy powder, for that cold smoke you’ll never forget. Steep skiing programs: “the perfect combination” of ski and alpinism. Beyond crowded ski-resorts, a world full of adventures is waiting for you! 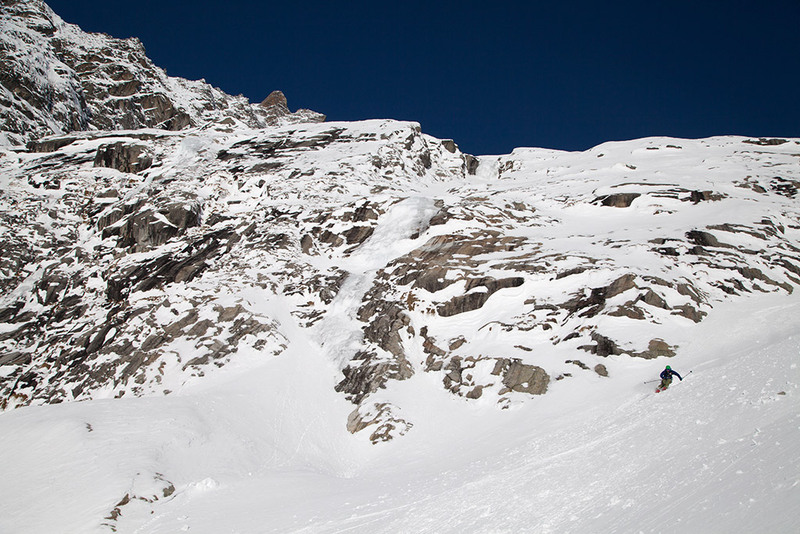 The most esthetic lines, untracked slopes and pure joy of skiing powder. 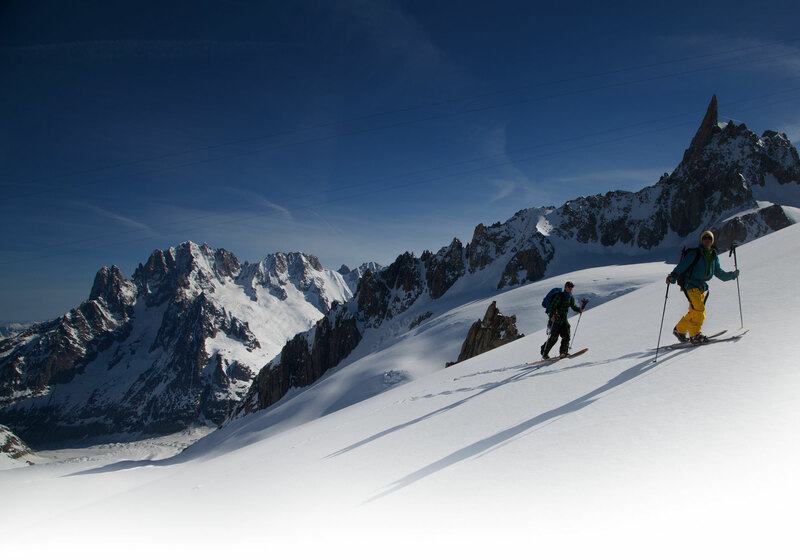 For experienced skiers and snowboarders with good physical training and desire of adventure. Our basecamp will be Courmayeur, in the italian side of Mont Blanc: from there we will decide where to go skiing, finding hidden corners, and, in case, moving in other ski resorts in order to find always the best snow conditions. 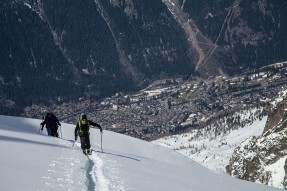 We will choose between: Courmayeur, Chamonix, Gressoney, Cervinia and La Thuile. We will find for you the best spot with the best snow. we suggest you to CONTACT US for a tailor made program. Groups: up to 4 people in relation to the chosen run. Costs: CONTACT US for more info! In case you miss something or need to rent some equipment, we will help you to find the best shops. Some of you could have the possibility to quit your everyday life at the very last minute and come skiing with us. 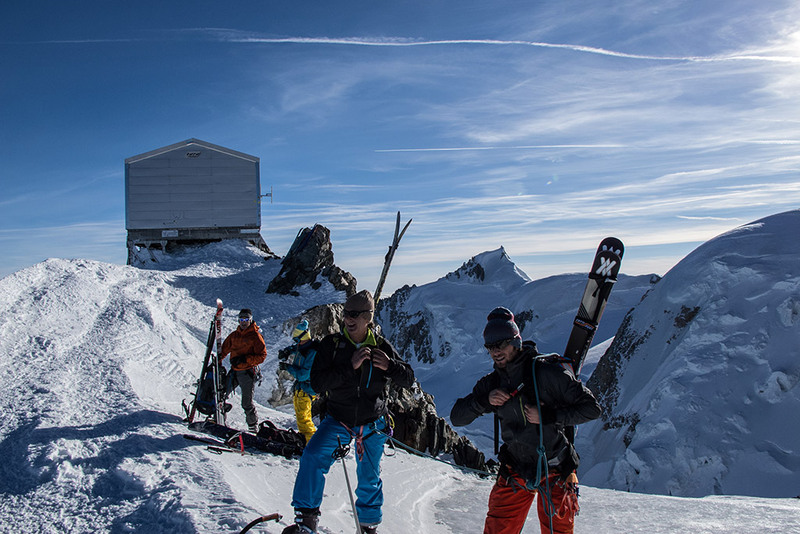 Get in contact NOW and plan a winter period for a “LAST MINUTE CALL” in order to organize wild ski trip in Courmayeur and have the opportunity to ski with us dream lines in epic snow conditions! If you want to go big you have to be prepared! for that cold smoke you’ll never forget. 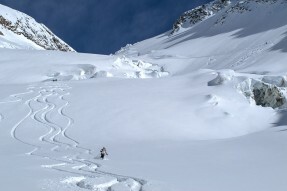 Valle d’Aosta is the perfect location for HELISKI. Setting our base in Courmayeur, we’ll have the possibility to select between 5 different heli-bases: Courmayeur, La Thuile, Valgrisenche, Cervinia and Gressoney. In relation to snow conditions and weather forecasts, we will have the chance to choose for you the best helidrops. we recommend to CONTACT US and ask for a tailor made program. In case you miss something or you need to rent some equipment, we will help you to find the best shops. Some of you could have the possibility to quit your everyday life at the very last minute and come skiing with us. 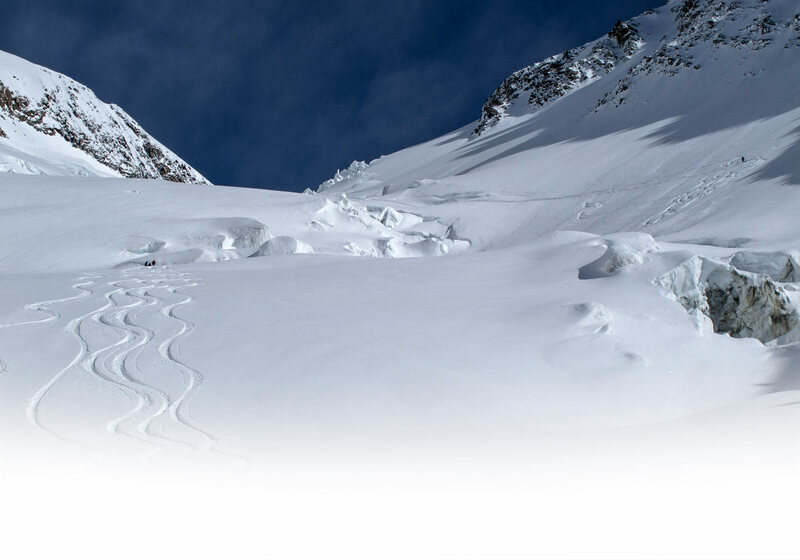 Get in contact NOW and plan a winter period for a “LAST MINUTE CALL” in order to organize wild ski trip in Courmayeur and have the opportunity to ski with us dream lines in epic snow conditions! If you want to go big, you have to be prepared! 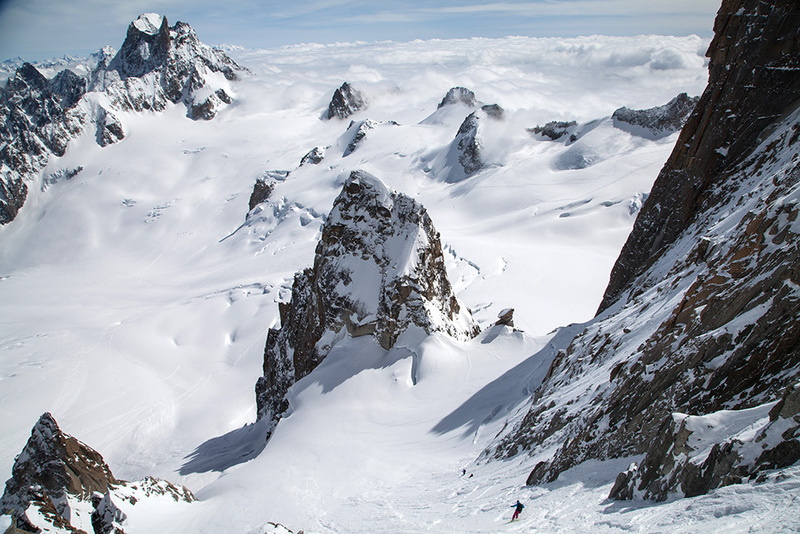 Every spring the north face of Mont Blanc gets massive snow storms, letting possible the ski descent of Mont Blanc from the very summit. 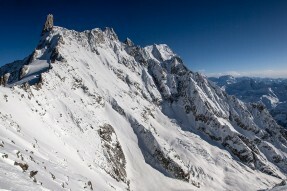 For all of you wishing to ski MB, we offer the possibility of an heli drop at Piton des Italien at 4000m. 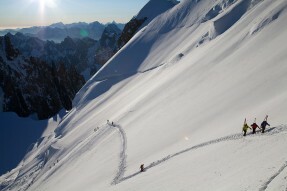 From there we will hike the last 800m and ski the legenday north face. For info and costs contacts us by phone or email. 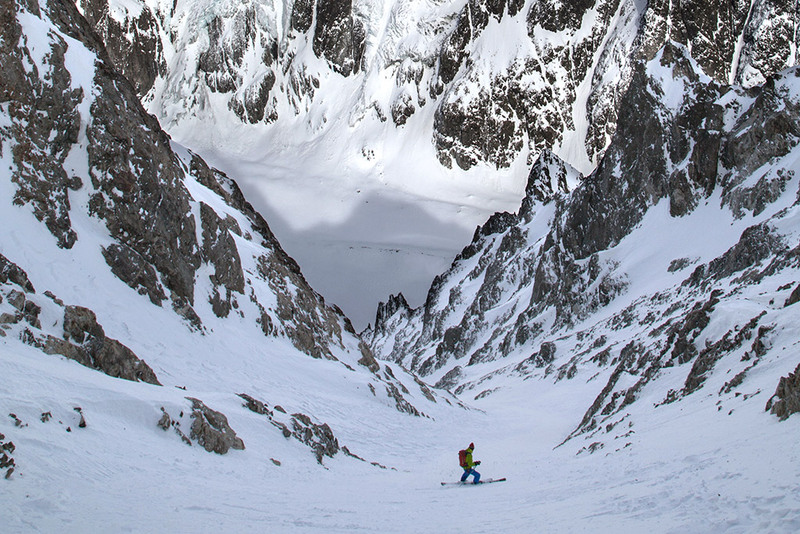 The magic steep lines: the dream ski descents for passionate skiers and alpinists. 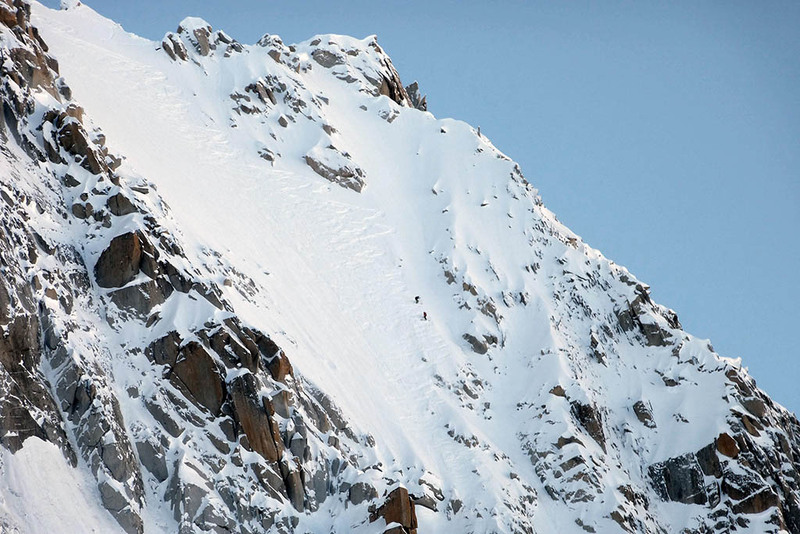 Steep skiing, or, “the perfect combination” of ski and alpinism. Following you’ll find THE list of “Dream Lines”. 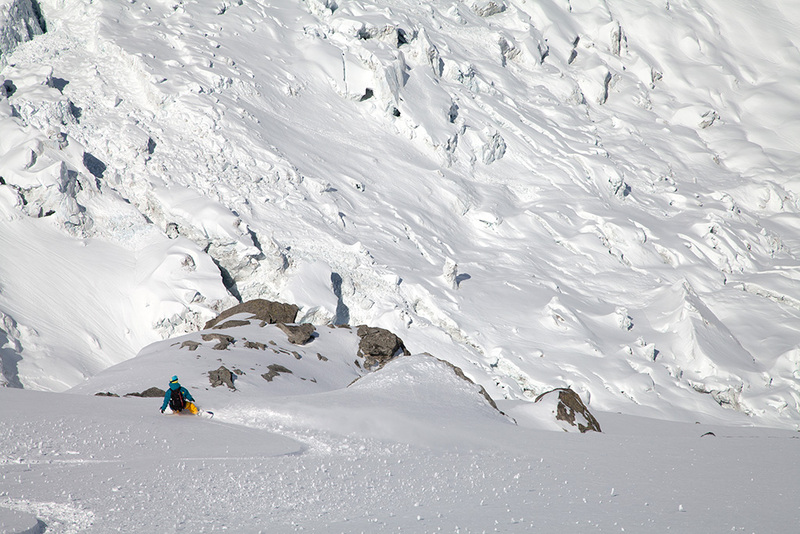 More than 10 years of experience in this kind of runs allow us to be the only Professional Mountain Guides who can help you to fullfil you secret dreams. 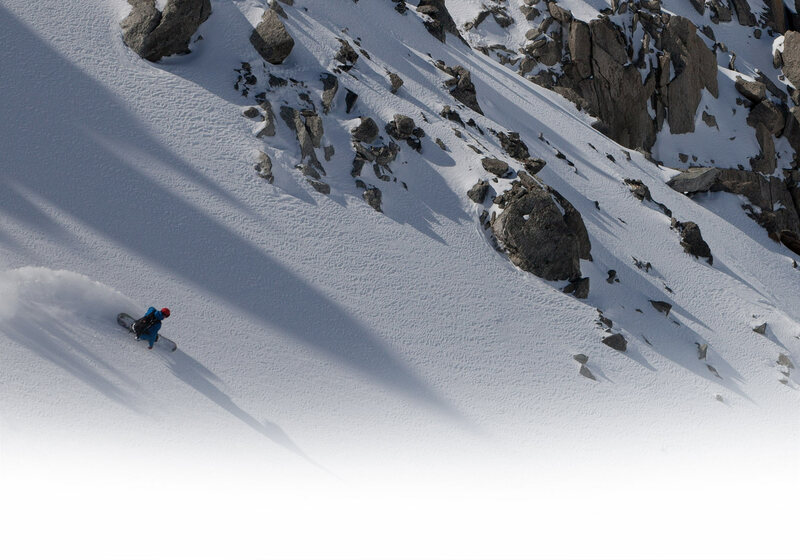 For top skiers, experienced in steep terrain. For all of you wishing to transfor your dreams in reality, we suggest to CONTACT US in the early winter in order to get in touch as soon as possible and create together some good plan. We can reach few steep lines with an heli drop. 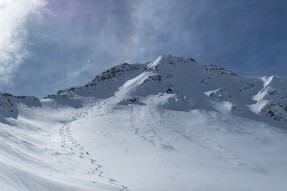 Few times it will be needed an extra hike to reach the start of the run. Contact us for costs info. 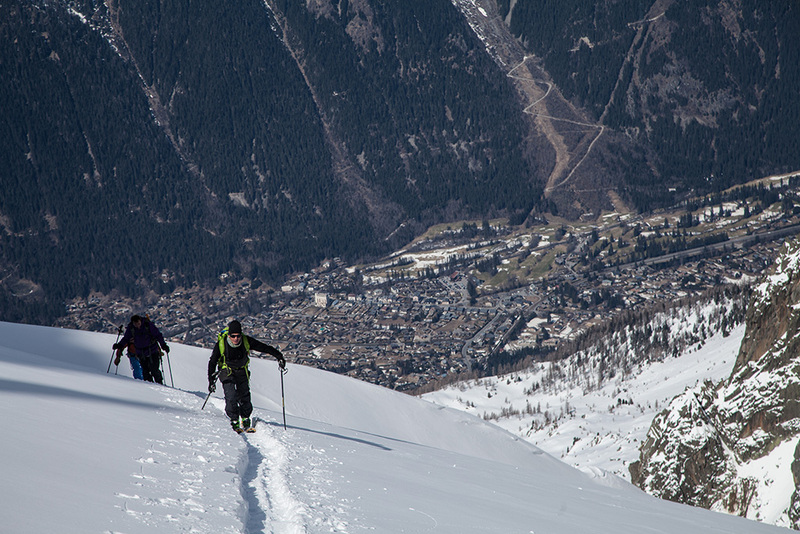 Beyond crowded ski-resorts, a world of adventures is waiting for you. 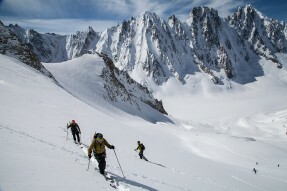 Backcountry is the evolution of ski-touring, in term of constant search for unique spot with the best snow, few people around and great aestethic. Physical and mental commitment is always important. In the snowboard world, Splitboard is the biggest evolution of the last 10 years: with this equipment even snowboarders will have the opportunity to reach the runs away from the lifts. Costs: From 400€ in relation to the chosen run. CONTACT US for info. In the wild Himalayan west face of Mont Blanc, mother nature prepared tons of long and large couloir. We spent many years exploring the area and enjoying long days of great riding with no one around. 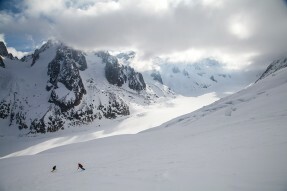 We offer you a special 2 days program called “Miage Experience”: we will go sleeping in Miage glacier with our tents in order to be ready the day after to climb and ski some big line! The experience accumulated over years spent on Mont Blanc allows us to be trusted guides for Cinema and Commercial Productions in the most dangerous place of the mountains. 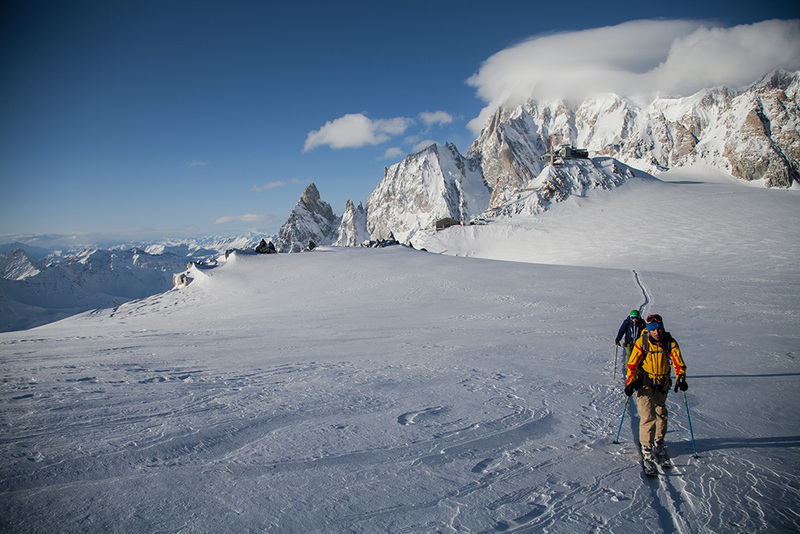 We have the ability to spot the best locations for every shot: knowing every corner of Mont Blanc we can lead ideas of DP and Photographer to reality. • 2014 Eagle Pictures: Point Break 2. Lead guide for the scouting and on-slope assistance for the “Snowboard Unit” shooting. 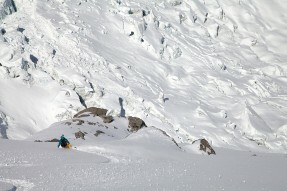 Heliski from “Piton des Italiens”: huge glaciers around us! Mont Blanc North Face: it’s like skiing on the moon! Just before dropping in Col du Diable – Macho Couloir!